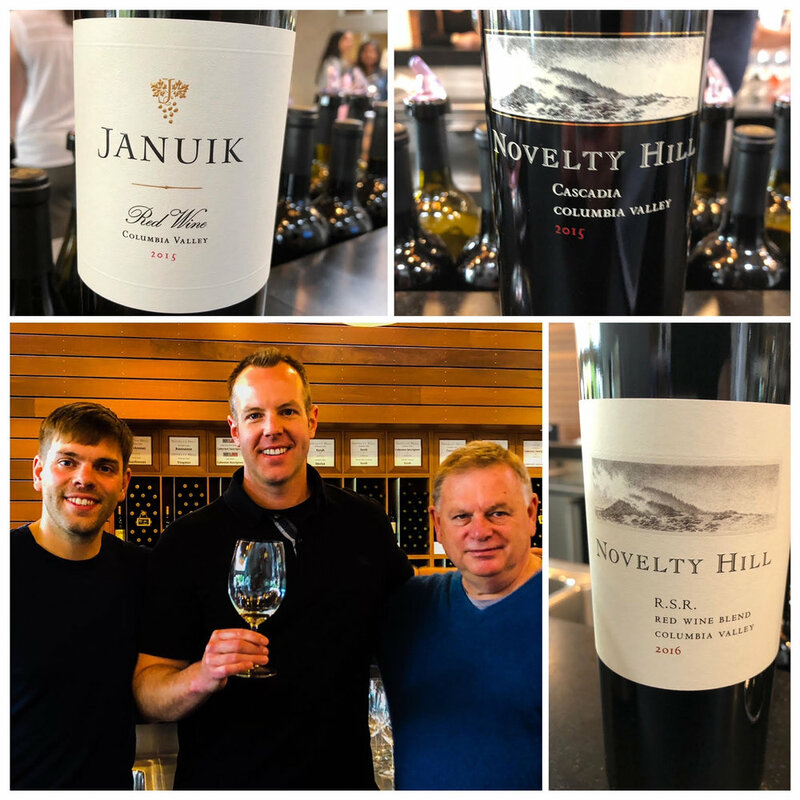 It was a marvelous opportunity to catch up with Mike and Andrew Januik, co-winemakers at one of Washington’s outstanding lineups of red and white wines, Januik and Novelty Hill. One one of my favorite wineries to visit in Woodinville, Novelty Hill-Januik is a gorgeous setting whether you are a tasting room neophyte or master sommelier. They generously donated their winery space for the Auction of Washington Wines this summer, which was a spectacular occasion. Previously I was there this summer visiting superstar winemaker Andrew Januik who guided me through the new releases that impressed from some hot vintages. Andrew recently spent some time working a harvest in Argentina. I think he had a blast down there. There are few Washington wineries that offer this range of quality wines at this price point. Year in and year out, Januik produces amazing wines from Sauvignon Blanc to Grenache to Syrah. If you have never had the chance to try the range of wines served here, it is a must visit. I tried more than 20 wines during my tasting and scored essentially all of them over 90 points, which I consider to be an incredible achievement. The winery sources from some of the most esteemed vineyards in the state, including Champoux, Stillwater Creek, and Weinbau Vineyards. Truly what has consistently been one of the best Sauvignon Blancs in the state for the price is the 2017 Novelty Hill ‘Stillwater Creek’ Sauvignon Blanc (WWB, 91) is a downright killer value and impresses with its gorgeous minerality and range. This is one to purchase by the case. Other impressive new release wines included the 2013 Januik ‘Columbia Valley’ Merlot (WWB, 92), which is another amazing value buy. I absolutely adore the new 2015 Novelty Hill ‘Cascadia’ Red Wine (WWB, 93), which is the third year that they have made this wine. The new edition shows a wonderful terroir driven palate, loaded with dark fruits. Learn more about this impressive new lineup of wines at http://www.noveltyhilljanuik.com/ Here are the fantastic new release wines from Novelty Hill-Januik winery.